Praise be to Allaah, we praise Him and seek His help and forgiveness. We seek refuge in Allaah from the evil of our own selves and from our evil deeds. Whomsoever Allaah guides, none can lead astray, and whomsoever He sends astray, none can guide. Truthfulness is one of the pillars on which the moral survival of the world depends. It is the foundation of praiseworthy characteristics, the cornerstone of Prophethood, the result of taqwaa. Were it not for truthfulness, the rulings of all divinely-revealed laws would collapse. Acquiring the characteristic of lying is akin to shedding one's humanity, because speaking is an exclusively human trait. Our purely monotheistic sharee’ah warns against lying in the Qur’aan and Sunnah, and there is consensus that it is haraam. The liar will have bad consequences in this world and in the next. According to sharee’ah, lying is not permitted except in specific cases which do not lead to loss of rights, bloodshed or slander of people’s honour, etc., but which concern saving lives, reconciling between people, or creating love between husband and wife. There is a never a day or a moment when sharee’ah permits a person to tell lies or to say whatever he wants based on lies. One of the things that have become widespread among the common people is the so called “April Fool’s Day”, where they claim that the first day of the fourth solar month is a day when lying is permitted without being subject to any shar’i guidelines. 1. Lies told about Allaah and His Messenger (peace and blessings of Allaah be upon him). (narrated by al-Bukhaari, 110; Muslim, 3). “ ‘to tie two grains of barley together, but he will never be able to do it’ – because tying one to the other is not possible ordinarily. He will be punished until he does that, and he will never be able to do it. It is as if he is saying that he will be enjoined to do something that he can never do, and is being punished for it. This is a metaphor for continuous punishment… The reason why barley (sha’eer) is mentioned specifically is because dreams are connected to feelings (shu’oor); the words sha’eer (barley) and shu’oor (feelings) come from the same root in Arabic. The punishment for that is so severe – even though lies when awake may cause more damage, because they may involve testimony that may lead to execution or a hadd punishment – because lying about a dream is a lie about Allaah, may He be exalted, for dreams are a part of Prophethood, so they come from Him, and lying about the Creator is worse than lying about created beings. Some people think that it is permissible to tell lies if it is in jest. This is the excuse that they use for telling lies on April 1st or on other days. This is wrong. There is no basis for this in the pure sharee’ah. Lying is haraam whether the one who does it is joking or is serious. Lying in jest is haraam just like other kinds of lies. Abu ‘Eesa said: this is a saheeh hasan hadeeth. This hadeeth was classed as hasan by Shaykh al-‘Albaani in Saheeh al-Jaami’, 1319. (narrated by al-Tirmidhi, 235. He said: this is a hasan hadeeth. Also narrated by Abu Dawood, 4990). Then when He gave them of His Bounty, they became niggardly [refused to pay the Sadaqah (Zakaah or voluntary charity)], and turned away, averse. This hadeeth indicates that whoever continues to speak the truth, it will become a feature of his, and whoever deliberately tells lies and persists in it, it will become a feature of his. This is the same as any other good or evil characteristic, if a person persists in it, it becomes a feature of his. This hadeeth indicates how serious the matter of telling the truth is, and that it may lead a person to Paradise, and it indicates how ugly lying is and how it may lead a person to Hell. This is in addition to the consequences in this world, for the one who tells the truth will have his words accepted by people, and his testimony will be accepted by judges and he will be liked for what he says, whereas for the liar the opposite will be the case. The strongest reason why testimonies, fatwas and reports may be rejected is lying, because it corrupts the very essence of the testimony, fatwa or report. It is like the testimony of a blind man concerning sighting the new moon, or the testimony of a deaf man concerning having heard the admission of someone. The lying tongue is like some faculty that is no longer working, indeed it is even worse than that, for the most evil thing a man may possess is a lying tongue. Hence on the Day of Resurrection Allaah will make blackened faces the sign of the one who told lies about Him and His Messenger. Lying has a great effect in blackening the face and covering it with a mask of shame which every truthful person will be able to see. The feature of the liar is clearly visible in the face, and everyone who has the eyes to see can see it. But Allaah will bless the truthful person with dignity and respect, so whoever sees him will respect him and love him, and He will give the liar humiliation and shame, so whoever sees him will loathe him and despise him. And Allaah is the Source of strength. 1. ‘Abd-Allaah ibn Mas’ood said: “A man may speak the truth and persist in doing so until there is in his heart not even room for evil the size of a needle. Or a man may tell lies and persist in doing so until there is in his heart not even room for truth the size of a needle. 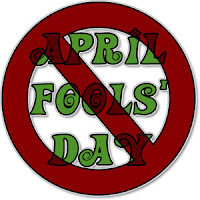 Some of the kuffaar call this day All Fools’ Day, as it is known to the English. That is because of the lies that they tell so that those who hear them might believe them and thus become a victim for those who are making fun of him.